Author adminPublished on 2012/09/07 Leave a comment on Youth Group underway! Here is a photo of the luminaries that they created last night. Published on 2012/09/07 Author adminLeave a comment on Youth Group underway! Christ Church was very happy to have the Rev'd Jesse Zink celebrate the eucharist and preach this past Sunday. We were delighted to meet his new wife, Debbie, prior to their move to England as PhD student and vicar respectively. Jesse signed copies of his book, Grace at the Garbage Dump, after the service. We look forward to following their various ministries in the United Kingdom. Chris Wilson reports that the youth group raised $3155.75 for World Vision during the 30 Hour Famine this year. This is a terrific accomplishment and the largest amount ever raised by the youth groups at Christ Church. Chris offers thanks to the grace of God, the help of Rev'd Jeffery Hooper and the Emsdale Youth, and the generosity of all of friends and family. We are very proud of the efforts to care for "the least of these". Youth will meet after Church on Sunday, June 24th to distribute rewards. What a blessed time we had on Sunday with Bishop Andrews! In this photo, the confirmation candidates are reciting the Apostle's Creed in Sign Language. Thanks to all who helped make this such a special occasion. 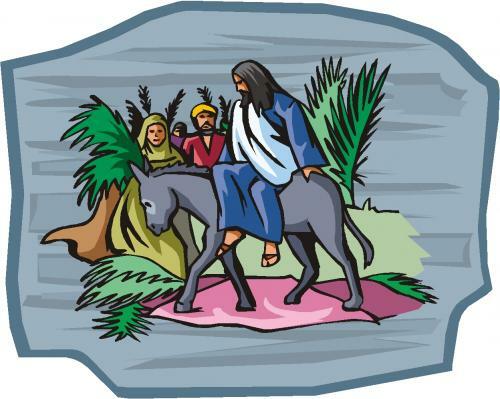 We are only a few days away from Palm Sunday. It is an odd time, this Holy Week, and the service that begins it seems so contradictory. We start with shouts of joy, waving branches and singing. Yet we end it in the somber realization that the dusty road, spotted with the tears of God, will lead to sacrifice and death. A week later, by God's grace, we will be stunned to discover that the One who was dead and gone, is alive and present. In this holiest of weeks, we are meant to remember all that happened. We are meant to remember not just as in "calling to mind" as we might remember an appointment or a fact. We are meant to remember as if we were actually present. In ancient times, this was known as anamnesis - almost like reliving an event in a "flashback". In this holiest of weeks, we are meant to think deeply about who Jesus reveals himself to be in his actions and words. We are meant to understand that Jesus demonstrates the person and character and emotion of God to us. And we are meant to respond to that - to Jesus' raw humanity and to his astounding display of a divinity that is so much at odds with what we expect. In this holiest of weeks, we are meant to recall that it was on the day corresponding to our Palm Sunday that the Jewish people of Jesus' day chose a perfect lamb (often from the flocks pastured in Bethlehem! )that would be sacrificed a week later. For a week, that chosen lamb lived in the home with the family, fed by hand, groomed and intimately examined. The week of examination allowed time for hidden flaws to be made clear. This was important, for the lamb that would be sacrificed needed to be perfect and without spot or stain. In this holiest of weeks, the world examined Jesus. They asked, "Is he truly the Lamb of God? Is he, as he claimed to be, without sin or stain? Is he truly the Son of God? Is it possible that this is the Messiah for whom we have longed?" In this holiest of weeks, we are meant to ask these uncomfortable questions as well. This is the week to examine the claims he made and ask whether his actions this week bear out his words. Jesus claimed to be the exact representation of God - to do and say and be only what the Father does and says and is. If that is so, then in this holiest of weeks, we are asked to examine our own hearts and minds as well. What do we actually believe ABOUT God? Is what we believe consistent with what we see in this week? The lamb lived with the family, and as they cared for it and fed it and groomed it, they naturally became more and more attached to it. We are meant to ask about the intimacy of our relationship with the Lamb of God. How well do we know this Lamb, really? And how tenderly do we care for the Body of the Lamb? In this holiest of weeks, the people of God grew to love that little lamb, and the day, corresponding to our Good Friday, that the Father carried that little one in his bosom to be slaughtered for the sins of himself and his family was day of weeping and wrenching sorrow. Scott Hahn observes "(St. Paul's) vision of the Passion is stunning. He shows us that it is not merely about how much Jesus suffered, but how much he loves. Love transforms suffering into sacrifice". In this holiest of weeks, we are meant to feel with God the Father as he sacrifices the Son he loves for the people He loves more than Himself. We are meant to feel with God the Son as he shudders with the terror and the pain and the shame and the unbelievable weight of all the sin and pain and grief and illness and death and horror that ever has been and ever will be. We are meant to feel with God the Spirit, as the aching, weeping Spirit flows back and forth between and around and with the Father and the Son in the dreadfulness of this week. We are meant to feel with the confused disciples, stricken friends, inconsolable mother, frightened officials and angry religious authorities as they all struggle to make sense of what is careening around them. In this holiest of weeks, we hope you will make it a priority to carve out time to allow this all to happen. We pray that the services and meditation stations offered to you will help you as you think, and ponder and feel your way through these dark days. And we pray that the wonder of Easter will burst forth from that darkness in a victory and joy deeper than you have ever known before. In this holiest of weeks, we pray you will indeed "See Jesus". Monday April 2 11am to 7 pm Meditation Stations open to the entire community ! Pitre, Brant (2011-02-15). Jesus and the Jewish Roots of the Eucharist (Kindle Locations 103-104). Random House, Inc.. Kindle Edition. The meeting scheduled for 5:00 tonight has been postponed to next Thursday, January 26 at 5:00 p.m. due to the inclement weather. We greatly enjoyed the talents of the congregation last Sunday at our annual pageant. Special thanks to director, Colleen, her teaching partner, Reid, and to Chris, Chuck and all who helped. The "Wise" men even made an appearance. The one on the right was wise enough to hide most of his face. Everyone is welcome to come to all or some of this workshop led by Rev'd Dr. Jay Koyle. Come gather with your sisters and brothers of Christ Church and discover an ancient yet new process that can promote such transformation in our congregation! Our time together will be highly experiential, including worship, discussion, presentations and demonstrations. After a meeting on September 2, 2011, we decided to renew the look of our webpage by using WordPress. We are hoping to create a visually appealing, easy to maintain, informative and welcoming web presence. If you have any suggestions for content or format, please leave a comment below. We will never share your information with any outside agency.